Shilajit is a little hard to explain, and it is almost a panacea in some circles. There are entire books on fulvic acid, one of the constituents of shilajit. Shilajit is created by run off in the Himalayas that deposits organic material into the crevices and fissures of stones. When the snows melt and the sun hits the rocks, a resinous substance softens and exudes. It is sometimes called bituminous pitch or asphaltum. It is dark red to brown to almost black in color and very bitter and is said to enhance the efficacy of any other formula taken. Sanskrit texts refer to shilajit as the "conqueror of mountains and destroyer of weakness." Shilajit has a high mineral content; so prized was the herb in ancient times that no major disease was believed to be curable without this asphaltum. Despite the very ancient history of use of shilajit, very little is really understood about its exact origin, even whether it is a plant material or mineral. Most likely, its resinous nature is due to the presence of mosses that have contributed to the formation of shilajit. The Ayurvedic forms of shilajit are purified using traditional processes spelled out in ancient texts. The Russian shilajit or mumijo is washed but raw. 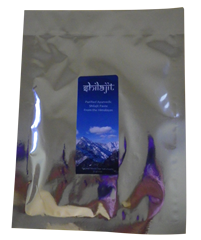 This shilajit is traditional, meaning that the raw material was harvested when the sun was beating against the slopes of the high Himalayas and processed again and again with water and then with herbs, mainly the three fruits used to make triphala. This is the form one should use to take shilajit. It is intensely bitter unless diluted in water or tea. It dissolves in water if stirred occasionally. The normal dose is half a gram to one gram per day, preferably two hours before eating. One package will therefore last 1-2 months. Shilajit is an extremely valuable source of trace minerals and is typically regarded as nourishing to the brain. Ingredients: purified shilajit from the Nepalese Himalayas in paste form. Some Ayurvedic pundits believe that all formulas work better if combined with shilajit. This famous Ayurvedic remedy is widely regarded as an anti-aging agent. It is a rejuvenative that cleanses the urinary tract and lungs; it enhances immunity and stamina. Shilajit purifies the blood by aiding the removal of excess kapha and toxins from the tissues. As an aphrodisiac, it increases vitality while toning the reproductive organs and supporting their proper function. It is balancing for all doshas and can be used for debility or weakness caused by age, injury or dysfunction. Ingredients: Shilajit (mineral pitch) with cellulose, stearic acid, and magnesium stearate, binders suitable for vegetarians.